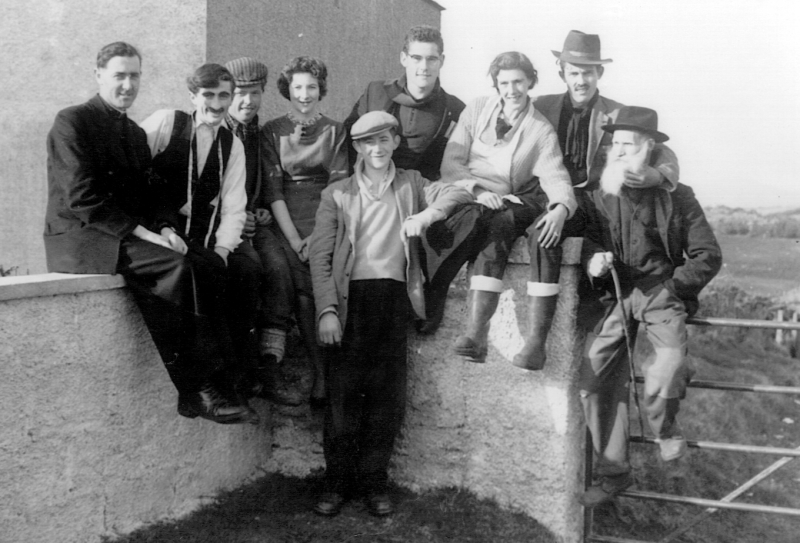 Shortly after returning to Renvyle in 1962 to begin my teaching career, I was recruited by Fr Ludden to get involved in the local drama group. Plays were put on during Lent at that time as dances were forbidden. We would all receive a copy of whatever play was to be performed and meet for a few readings initially, before the serious business of rehearsals would begin. The opening night of a play was always a huge event in the social life of the people at that time. I can remember years before that, when I was attending primary school, there was always a Christmas concert and play in the Monks’ hall in Letterfrack. We used to be six months looking forward to it and when it was all over we would be another six months talking about it. People nowadays could not possibly grasp the importance of it at the time and how much it meant to the whole community. Nowadays it is very hard to entertain people because they are so exposed to entertainment and they don’t really wonder at anything. However, entertainment was so scarce when I was young that people had a great sense of occasion whenever the opportunity presented itself. Back in the early 1960s, the only type of drama that people wanted was comedy. Even if we attempted a serious play, the audience would still start laughing, almost as soon as the curtain would be raised. It only took a few people to set everyone else off. Rehearsing was always hard work and difficult, yet we had so much fun and it was always really worth it in the end. In 1964 we performed a play called ‘Marriage is a Lottery’ and the opening night in the Marian Hall, Tullycross, was one I will never forget. The hall was packed and the atmosphere was electric. We brought the play to Inishbofin. I remember I was a tailor and in one particular part of the play I was sitting down at a table and not really making much headway with a particular suit. The fellow I was making the suit for would throw a big roll of tweed in through the window. I would be sitting at the table having my dinner and normally it would hit me and I would fall. However, the stage in Inishbofin was very small and whatever way I was situated, I could actually see the roll of tweed coming for me. There were people sitting right under the stage and whatever way I pulled back my head, the roll of tweed missed me, landed on the table and knocked the contents down on the people in the front row. I will always remember one young lad in a minor state of shock, wiping milk off his face. Picture: Marian Players 1964, “Marriage is a Lottery”. Pictured l to r: Fr Stephen Ludden, Michael O’Neill, Joey Ribbon, Maureen O’Neill, Vincent Little, Kevin McDonald, Chrissie O’Malley, Mikey Gannon and John Mark Coyne. We also brought the play to Kylemore Abbey, where we performed for the Benedictine nuns. Even though the play was a comedy we were not getting much in the way of laughs. Again, I found myself sitting down at a table having my dinner. Whatever way I mixed up my lines, I suddenly found myself into the third act of the play when I still should have been in act two. The line I had to say will always be indelibly imprinted on my mind because I sweated blood with embarrassment over it. The line was, “I stand here, erect, free and independent”. I remember saying to myself; “I can’t say that sitting, down”. I was forced to improvise, as can often be the case in drama, so I grabbed a knife, stuck it into a half-pound of butter which was on a plate, put the plate over my head, stood up and said “I stand here erect, free and…” It failed me four times to finish the line because I was not able to contain myself and had burst out laughing. Laughing is infectious and the rest of the cast on stage with me followed suit. I can still remember Fr Ludden, who was prompting us from side stage scratching the leg of his trousers with embarrassment. He had been very anxious for us to put on an impressive performance for the nuns.